The study, "Agricultural Landscape and Pesticide Effects on Honey Bee Biological Traits" which was published in a recent issue of the Journal of Economic Entomology, evaluated the impacts of row-crop agriculture, including the traditional use of pesticides, on honey bee health. Results indicated that hive health was positively correlated to the presence of agriculture. According to the study, colonies in a non-agricultural area struggled to find adequate food resources and produced fewer offspring. "We're not saying that pesticides are not a factor in honeybee health. There were a few events during the season where insecticide applications caused the death of some foraging bees," says Mohamed Alburaki, lead author and post-doctoral fellow with the University of Tennessee Department of Entomology and Plant Pathology (EPP). "However, our study suggests that the benefits of better nutrition sources and nectar yields found in agricultural areas outweigh the risks of exposure to agricultural pesticides." Alburaki and fellow researchers established experimental apiaries in multiple locations in western Tennessee ranging from non-agricultural to intense agricultural production. Over the course of a year, colonies were monitored for performance and productivity by measuring colony weight, brood production and colony thermoregulation. Colony thermoregulation, or the ability to maintain an optimal temperature within a hive, is an important factor in brood development and the health of the resulting adult bees. According to the study, hives located in areas with high to moderate agricultural vegetation grew faster and larger than those in low or non-agricultural areas. Researchers suggest the greater population sizes enabled better colony thermoregulation in these hives, as well. "One possible explanation for this finding could be the elevated urban activity in this location," says Alburaki. "Ornamental plantings around homes or businesses, or backyard gardens are examples of urban activity that increase the diversity of pollen in an area. 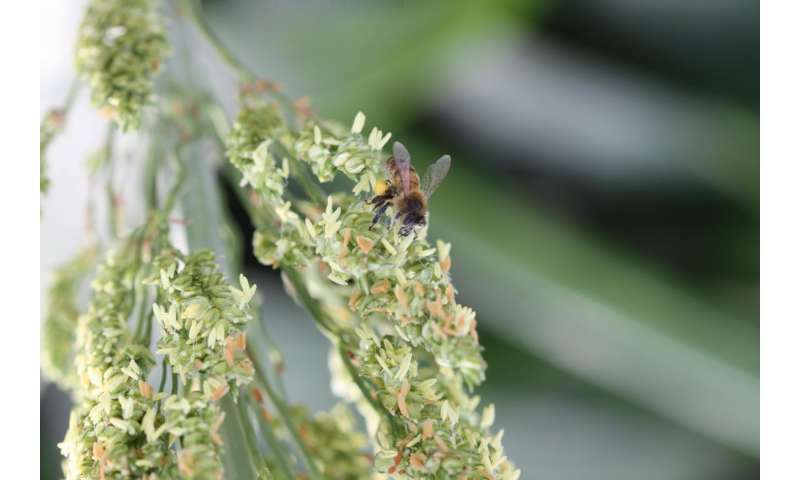 Greater pollen diversity has been credited with enhancing colony development." "We train agricultural producers on careful selection and conscientious application of pesticides to reduce bee exposure," says Scott Stewart, Integrated Pest Management Specialist with UT Extension, "but it's becoming more clear that the influences of varroa mite and food availability are more important factors in honey bee health than agricultural pesticides." Under full disclosure, would like to know who funds his research.